Musicians get dumped on if they speak up about politics and receive stern comments is they ignore the issues in the songs. As in any area, an understanding of the political landscape balanced with knowledge of how it affects the citizens of the world makes for the best commentary. Standing at the front of the line with seeing how it all fits is Billy Bragg. The U.K-based singer/songwriter has led the march in the battle of us against them for several decades, naming names and becoming a voice for needed actions to right the wrongs with his words and music. Musicians taking on the governmental attacks in the current political climate need to spit out songs at a rapid rate to keep up with the daily deluge of drama. Rather than waiting for a full album’s worth of problems and solutions, Billy Bragg recently released an E.P., Bridges Not Walls. Of the need to get out the message, Billy felt that ‘life comes at you real fast these days. What’s a singer-songwriter to do when events keep challenging the way that we see the world? Before we’ve had a chance to digest one startling development, along comes another to throw us off balance again. I’ve been grubbing up songs for the past 12 months, but without the time to get an album together due to other projects, so in an effort to keep pace with these chaotic times I decided to start dropping tracks as they became ready across the summer culminating in a mini album. As always, they’re my way of trying to make some sense of what’s going on. And there's been a lot going on’. The album title acts as a warning label for the small minds that want to isolate rather than connect as Bridges Not Walls pulls down the need to separate with sharp-edged guitar slashes that chip away at the bricks in “Why We Build the Wall”. 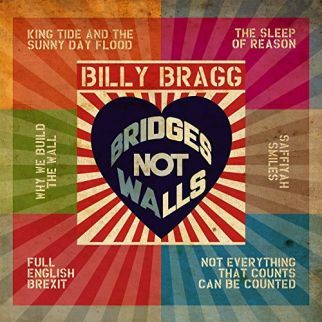 Billy Bragg opens Bridges Not Walls with “The Sleep of Reason” entering on marching beat while hushed piano notes whisper like the thinly-veiled hate born of fear uttered on “Full English Brexit”. Climate change feels the heat rise in the words of “King Tide and the Sunny Day” as Bridges Not Walls watches truth devalued along with dollars as it speaks to a financial marketplace in “Not Everything That Counts Can Be Counted”. Billy Bragg shows that heroes are made with a simple grin as Saffiyah Khan steps up to protestors in Birmingham, England in “Saffiyah Smiles”.